One of the oldest livestock organization in the U.S. will meet April 7 in La Junta, with a full agenda of activities. 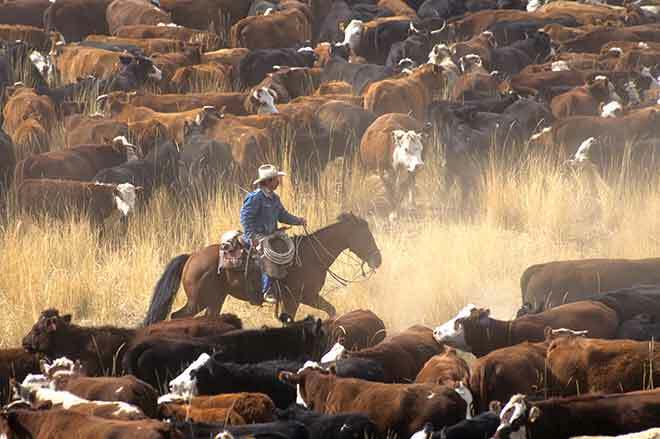 The Bent-Prowers Cattle & Horse Growers Association will kick off the association's 149th year with annual meeting, auction, banquet and cowboy ball with events Saturday, April 7 at Inspiration Field, 612 Adams Ave in La Junta. "Bringing Profit to Cow-Calf Producers" will be the topic of a panel featuring Steve Ptolemy of Best Bet Beeflot, Justin Homm of AGRI Beef, and Rick Robbins of Colorado Mills. The educational panel starts at 1 p.m. and is open to the public. It will be followed by ag industry updates and the annual business meeting. The association serves Baca, Bent, Crowley, Kiowa, Otero, and Prowers county ranchers and ag supporters. Farm Credit of Southern Colorado is providing afternoon refreshments. Southeastern Colorado Junior Cattlemen Association also will hold afternoon activities. A cowboy punch bowl, sponsored by La Junta Livestock Commission will begin at 5:30 p.m. It will be followed by the banquet at 6:00 p.m., which also will include an auction, awards presentations and entertainment, in addition to the Prime Rib meal. Tom and Donna Hatton, ranchers from Woodland Park, weave western heritage into their music, cowboy poetry and stories. The Hattons, who are past Western Artists Will Rogers Award recipients, will entertainer during the supper. The dance, put on by KVAY Radio, will begin about 8:00 p.m.
President Nolan Davis of Lamar noted generous table sponsors include Best Bet Beetlot, KLMR Radio, KVAY/25-7 Media, Karney Land & Cattle, Legacy Bank and Smitty's Auto Body. Tickets may be purchased from Davis by calling 970-219-6403; from Matt Neuhold at 719-688-9522, from Amber Freouf at 719-688-1184, or by going to WW Feed & Supply, 303 W. First St., La Junta. Banquet, entertainment and dance combo tickets are $25 per adult, and $15 per youth age 18 and under. Bent-Prowers Cattle & Horse Growers Association was organized in 1870. For more information, call 719-384-4463.